Alkyne C8 dT and dC can be used to incorporate an active alkyne onto the 5�- or 3�-end of an oligonucleotide, as well as at an internal position. The alkyne group is separated from the oligo by an 8 carbon spacer arm, which serves to reduce steric interaction between the reactive group and the oligo and allows multiple sites to be used. 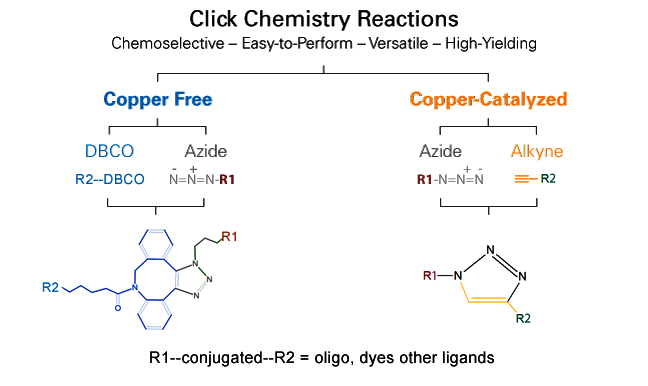 The presence of the alkyne allows the user to use �Click Chemistry� (a [3+2] cycloaddition reaction between alkynes and azides, using copper (I) iodide as a catalyst) to conjugate it to a variety of azide-containing labels/tags (e.g., fluorescent dyes, biotin, or oligos, with extremely high regioselectivity and efficiency (1,2). When conjugation to an azide-oligo is desired, preparation of the azide-oligo can be achieved using either an Azidobutyrate NHS Ester or the 5�-Bromohexyl modifier (see their respective tech sheets for details). Click chemistry can be used to form short, cyclic oligos that can be used as research tools in various biophysical and biological studies (3). In particular, they have considerable potential for in vivo work, as cyclic oligos are known to be very stable in serum for up to several days. 1. Huisgen, R. Angew. Chem. Int. Ed. (1963), 2: 565-568. 2. Rostovtsev, V.V., Green, L.G., Fokin, V.V., Sharpless, K.B. A Stepwise Huisgen Cycloaddition Process: Copper(I)-Catalyzed Regioselective Ligation of Azides and Terminal Alkynes. Angew. Chem. Int. Ed. (2002), 41: 2596-2599. 3. Kumar, R., El-Sagheer, A., Tumpane, J., Lincoln, P., Wilhelmsson, L.M., Brown, T. Template-Directed Oligonucleotide Strand Ligation, Covalent Intramolecular DNA Circularization and Catenation Using Click Chemistry. J. Am. Chem. Soc. (2007), 129: 6859-6864.